Candy Bar Favors make the perfect Wedding Anniversary Party Favor! What better way to honor the happy couple, then to display their names, and maybe even their pictures on a beautiful candy bar wrapper. Complete with their names, Wedding date, even a picture if you like. We can add a picture to most of our Anniversary Candy Bar Wrappers. 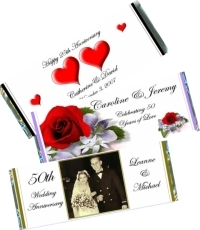 Personalization is FREE, adding a photo is FREE, foil sheets are FREE, we can even customize a one of a kind Anniversary Candy Bar Wrapper for you FREE! Whether it's a 25th Wedding Anniversary, or a 50th Wedding Anniversary Party, you can't go wrong with a delicious chocolate bar wrapped up in a beautiful candy bar wrapper! Having a 10th Anniversary, or a 30th Anniversary? No problem! We have Anniversary designs for everyone! 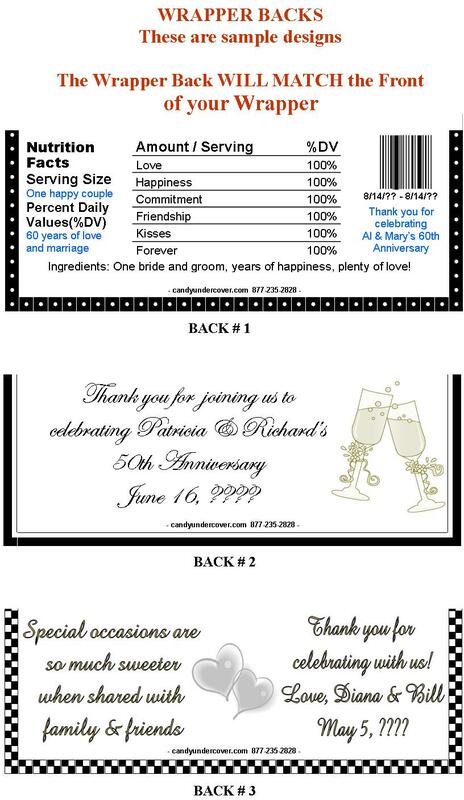 If it's a Golden Wedding Anniversary party favor your looking for, we have some beautiful designs. All of our designs can be changed to read whatever you like! We can even changed our Anniversary wrappers for a company Anniversary! Order the CANDY BAR WRAPPERS ONLY. We will provide the SILVER FOIL underlay and PERSONALIZED WRAPPERS! *This is a DIY Candy Bar Wrapper project. We do NOT provide the candy bars!! *Our wrapper/foil combo will fit 1.55 oz "Regular" Size Hershey bars, and Kit Kat Bars! *Assembly is required by customer *To sum it up: YOU buy the chocolate bars, YOU wrap the candy bar with silver foil provided, then wrap with your beautiful personalized Anniversary Candy Bar Wrapper. Order the fully WRAPPED CANDY BARS. We will do the work for you! Your Anniversary Candy Bar Favors will arrive to you all wrapped up and ready to give to your guests.